This picture was taken on my 4th day camping in Sturgis. 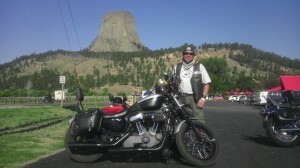 In the background you can see the Devil's Tower, in Wyoming. Since I paid to get in to the park, it didn't seem right not to roam around the hiking trail along the base of the structure. The natives leave colored cloths on branches of trees where they perform religious stuff. I don't know what the significance of this gesture represents, but hikers are warned in signs along the trail to leave these fabrics, about the size of a handkerchief alone. Also part of the ceremonies left behind by natives are bundles of natural rubble like branches, logs, stones.